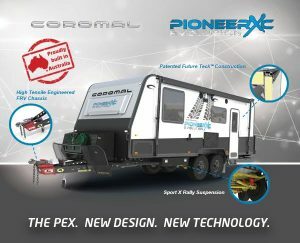 Boasting new and improved design, technology and construction and endless new features, you will be blown away by Coromal’s new ‘Pioneer Evolution XC’. Making it’s grand debut at NSW Caravan Camping Holiday Supershow, this April 24th-29th, this is definitely a caravan you will want to feast your eyes on! With new designs and technologies such as the high tensile engineered FRV chassis which is an impressive 130 kg lighter than the standard built chassis and is manufactured here in Australia from 550 grade steel, typically used in high end engineering applications. The exterior also features an airfoil to deflect wind while you are towing and improve fuel economy, as well as a new upgraded suspension to the new ‘Sport X Rally’ to be sure you are well equipped to enjoy off-road travel. The sleek, contemporary interior is coherent with the ‘Pioneer’ range, and has a floor plan that is available in 5 different style from single beds, right up to the large family units. Being an off-road van, the interior is well equipped to cope with the journey with the overheads being built with aluminium at the front, back and bolted into the external frame making them incredibly strong and secure. You will also find that the entire structure of the van including bench tops and walls, are made completely wood-free, which means no more worrying about any water penetration damaging the interior. The Coromal ‘Pioneer Evolution XC’ is the ultimate off roader, designed for the Aussie adventurer looking to set off on their next adventure. If you are heading to the NSW Caravan Camping Holiday Supershow, this April 24th-29th, make sure you head to the Coromal and check out the newest member of the Coromal family for yourself.